Al Shabaab has engaged in increasingly menacing attacks, usually against civilian soft targets, since the 2013 strike at Westgate shopping mall in Nairobi, Kenya, which killed 67 people. In December 2014, al Shabaab killed 36 non-Muslim Kenyan quarry laborers in the Mandera region near the Somali border; it be-headed several of them. It has conducted a series of suicide bombings in Somalia’s capital city, Mogadishu. The most recent horrific attack occurred in April 2015 at Garissa University College in northeast Kenya. It resulted in 147 deaths, nearly all of them non-Muslim Kenyan students. These and other attacks have led to a robust debate among those who follow al Shabaab’s activities in the Horn of Africa. Some have argued these tactics suggest “al Shabaab is desperate” (Maruf 2015), while others say al Shabaab “looks stronger than it has in years” (Dörrie 2014). This debate mostly misses the point. Al Shabaab is doing whatever is necessary to remain relevant in the region and to capture headlines. In other words, it is highly adaptive. It has no scruples and shows no remorse when it kills innocents. It does not appear to be concerned about alienating any group, Somali or non-Somali. Increasingly, it is competing for attention and resources with groups such as the Islamic State, al-Qaeda in the Arabian Peninsula, and al-Qaeda in the Islamic Maghreb. Five to ten years ago, small numbers of Somalis in the North American and European diaspora joined al Shabaab. Today, an even smaller number of Somalis is torn between joining al Shabaab or the Islamic State. Consequently, no act is too heinous to escape al Shabaab’s consideration. The bar for terrorist actions has become very low and al Shabaab has successfully accommodated the evolving situation. But this means neither that al Shabaab is desperate nor that it is gaining strength. Instead, it is surviving by adapting. Paul D. Williams (2014) offers four reasons why al Shabaab has been forced to reinvent itself. First, al Shabaab leaders realized they could not defeat their opponents by conventional military means. Second, the organization lost support from within key clan constituencies. Third, al Shabaab’s extreme ideology became a weakness. Finally, the African Union Mission in Somalia (AMISOM) and Somali security forces put pressure on al Shabaab. Though this is all forcing the organization to reinvent itself, Williams concludes, as a result, that al Shabaab is not resurgent (Williams 2014: 909-913). David M. Anderson and Jacob McKnight (2014: 26) also buy into the “reinvention” assessment. They draw on the analyses of Bryden and Williams, to explain why al Shabaab has decided to take its struggle to Kenya. Jeffrey Gettleman (2015), the East African bureau chief for the New York Times, remarks that al Shabaab fighters are proving to be frighteningly resilient. Drawing on remarks by Stig Jarle Hansen, a Norwegian expert on al Shabaab, Gettleman says al Shabaab’s endless evolution offers an object lesson in the battle against extremists. The attack, for example, on Garissa University College illustrates that al Shabaab has become proficient in “mass murder on the cheap.” In its Country Reports on Terrorism 2014, the U.S. State Department even concludes that “the loss of territory, revenue, and leadership hampered al Shabaab’s operational capabilities for a time, but the organization regrouped in new safe havens to continue planning and launching attacks and suicide bombings in Somalia, Kenya, and Djibouti” (Bureau of Counterterrorism 2015: 11). Importantly, while each of these accounts identifies some of the setbacks faced by al Shabaab in the past several years, they also emphasize its ability to adopt new tactics and even strategies in order to avoid defeat. Although al Shabaab has not been able to increase its military strength, thanks to its success in conducting a broad spectrum of asymmetrical attacks in an increasingly radicalized Kenya, throughout Somalia, and elsewhere in East Africa, it remains good at capturing international news headlines. Al Shabaab has similarly demonstrated that it can overcome the challenge of decapitation strategies. In 2008, a U.S. cruise missile killed the head of al Shabaab, Aden Hashi “Ayro,” in the town of Dusa Mareb in the Galguduud region of central Somalia. Ahmed “Mukhtar Abu al-Zubayr” Godane eventually replaced Ayro. Under Godane’s leadership, al Shabaab reached the height of its territorial, economic, and military power but then lost much of its territory and most of its urban centers in Somalia (Anzalone 2014: 22). In September 2014, a U.S. airstrike killed Godane in the Lower Shabelle region of Somalia. Several days later, a counterterrorism adviser to President Hassan Sheikh Mohamud privately predicted that Godane’s death would be a game changer and lead to a power struggle in al Shabaab. Within a week of Godane’s death, however, al Shabaab named Ahmed Omar Abu Ubeid as its new leader. Ubeid led the organization when it murdered the innocents at Garissa University College and he remains in charge today. Following the death of Godane, Berouk Mesfin (2014), an Ethiopian analyst at the Institute for Security Studies in Addis Ababa, concluded that al Shabaab would remain a major threat in the Horn of Africa and that the organization would “survive beyond Ayro and Godane—who are seen to have died a martyr’s death.” There is no reason to believe that the death or removal of Abu Ubeid or even his successor would result in the collapse of al Shabaab. Although internal disagreements are currently the greatest threat to al Shabaab’s survivability, it has shown so far that it can transition from one leader to another, decapitation strategies notwithstanding. Ken Menkhaus (2014: 8) points out that the most dangerous elements of al Shabaab could even survive the organization’s ultimate defeat by morphing into another entity, perhaps a violent criminal organization. There is growing pressure on al Shabaab’s external sources of finance, which have been described as “precarious, unreliable and inconsistent” (Keatinge 2014: 11). Somali diaspora contributions have declined dramatically as a result of a crackdown on supporters in North America and Western Europe and al Shabaab’s increasing reliance on extreme violence and intractable ideology. Moreover, al Shabaab’s connection with al-Qaeda has become less remunerative because of al-Qaeda’s own funding constraints, while Eritrea, once a source of state-sponsorship, has either ended or sharply reduced its support. Al Shabaab is now largely reliant on internal funding. It has created a highly effective taxation system in the geographical areas of Somalia that it controls. Although it has lost control of the lucrative Bakara Market in Mogadishu and the ports of Kismayo and Barawe, it still manages to earn substantial income from the charcoal trade by enforcing tolls on the roads that lead to the ports (Keatinge 2014: 12-21). The latest report by the UN Monitoring Group on Somalia and Eritrea (2014: 11) concludes that al Shabaab is generating more revenue from the charcoal trade than it did when it controlled the port of Kismayo, a sure sign of the organization’s ability to adapt under pressure. While a foreign force, such as AMISOM, can restrict al Shabaab’s operations in Somalia, it probably cannot defeat the committed and now largely Somali and regional al Shabaab organization. Only a committed Somali government army and police force that has the backing of most of the Somali population can defeat al Shabaab. Unfortunately, Somalia is not even close to developing such a force. Vanda Felbab-Brown (2015a; 2015b), a senior fellow at the Brookings Institution, reports that the Somali government does not control its military; instead, it is just a collection of clan militias. Areas reclaimed by AMISOM tend to be turned over to the Somali government-affiliated clan militia that then wants to impose its own will. This creates animosities and may drive the local people back into the arms of al Shabaab. Indeed, exclusionary clan politics in the southern-most part of Somalia have enabled al Shabaab to coopt marginalized clans. Even AMISOM itself is hamstrung. First, Kenyan and Ethiopian forces report back to Nairobi and Addis Ababa respectively, rather than AMISOM headquarters in Mogadishu. Second, AMISOM operates only in Somalia and has no mandate to counter al Shabaab attacks in neighboring Kenya. Nevertheless, it is primarily due to AMISOM’s military intervention that al Shabaab’s fighters have declined from an estimated high of 7,000 to perhaps 3,000 today (Gettleman 2015). Foreign fighters from outside the Horn of Africa have also declined in numbers. This is due to the difficult conditions of operating in a geographically reduced rural area, an al Shabaab leadership decision to purge some of the foreign fighters, and more appealing places for non-Somalis to fight in other parts of the world. On the other hand, al Shabaab still attracts Somalis and non-Somalis from inside Somalia and throughout the region, especially Kenya but also Tanzania, Uganda, and Djibouti. Interviews with 88 former al Shabaab fighters in Mogadishu indicated that 98 percent of them believed Islam was under threat in Somalia. This threat was often associated with predominantly non-Muslim countries, presumably including neighboring Kenya and Ethiopia. Most of the persons interviewed were attracted to al Shabaab because it was feared and respected and, as fighters, they too would be armed and respected. Many of the interviewees noted the presence of Kenyan nationals in al Shabaab’s higher echelons, demonstrating that it has successfully created a jihadist organization that extends beyond the borders of Somalia (Botha and Abdile 2014). This begs the question—why has al Shabaab been able to recruit successfully in Kenya? Interviews with 95 al Shabaab associates in Kenya suggest that the government’s inability to address the population’s growing radicalization has enabled al Shabaab to recruit fighters there, further facilitating the influence of al Shabaab in Kenya and the wider region. When asked to identify the single most important factor that caused respondents to join al Shabaab, 65 percent cited the Kenyan government’s counterterrorism strategy. Interviewees claim that the government and security forces hate Islam, and that all Muslims are treated as terrorists. They also cite the assassination of Muslim leaders and the extra-judicial killing of Muslims (Botha 2014). Anderson and McKnight (2014: 26) agree that the Kenyan government’s policy of alienating and victimizing the Muslim population is making matters worse, which will likely prolong al Shabaab’s ability to attract support in Kenya, despite the organization’s declining ability to recruit from the Somali diaspora. There seems to be almost universal agreement among analysts that the solution to defeating al Shabaab requires an effective and non-corrupt Somali government that has the support of the vast majority of the Somali people. In view of Somalia’s history since independence, this is a tall order. Greg Mills of South Africa’s Brenthurst Foundation, and Dickie Davis (2015), a retired British Army major general, visited Somalia early this year and reported that the state operates as a clan-based mafia, where entwined business and political interests feed off each other. Clan dynamics are believed to be as much of a threat to the sovereignty of Somalia as al Shabaab. While some aspects of the economy are booming, corruption seems to “be the oil that greases the current wheels, but it will prove a cancer that undermines both internal consent for the government and international trust and partnership” (Mills and Davis 2015). Felbab-Brown (2015a) agrees. She found much economic activity when she visited Somalia in March 2015, but notes that it was combined with considerable corruption. Thus, there was a sense that increased economic activity was resulting in quick profits for Somali elites without trickling down to most average Somalis. Nicholas Kay (2015), the UN Secretary-General’s special representative for Somalia, recently acknowledged that the primary task ahead is building a federal Somali state. While he expressed cautious optimism this will happen, he acknowledged that the political process is behind schedule. He also expressed concern about the Somali government’s annual budget of only $260 million and said sufficient jobs are not being created in Somalia, a country where 70 percent of the population is under 30. Perhaps the most worrisome evidence came from the survey of 88 former al Shabaab fighters in Mogadishu. The vast majority of them agreed with the statement that the Somali “government only looks after and protects the interest of a few” (Botha and Abdile 2014: 10). This leads me to conclude that al Shabaab has done a good job, from its perspective, of avoiding defeat and adapting to new challenges. At this point, it is not even accurate to describe it as a desperate organization. At the same time, al Shabaab has failed to increase its prospects for taking control of Somalia and achieving its ultimate goal—an Islamic caliphate. A unified Somali government with a coherent strategy could have al Shabaab on the ropes. Unfortunately, this goal too seems illusive. Anderson, D. M., and McKnight, J. (2014). Kenya at war: Al Shabaab and its enemies in Eastern Africa. African Affairs, 114(454), 1-27. Anzalone, C. (2014). The life and death of al-Shabab leader Ahmed Godane. CTC Sentinel [online], 7(9), 19-23. Available from: https://www.ctc.usma.edu/v2/wp-content/uploads/2014/09/CTCSentinel-Vol7Iss96.pdf. Botha, A. (2014). Radicalisation in Kenya: Recruitment to al-Shabaab and the Mombasa Republican Council. ISS Paper [online], 265. Available from: http://www.issafrica.org/uploads/Paper265.pdf. Botha, A., and Abdile, M. (2014). Radicalisation and al-Shabaab recruitment in Somalia. ISS Paper [online], 266. Available from: http://www.issafrica.org/uploads/Paper266.pdf. Bryden, M. (2014). The reinvention of Al-Shabaab: A strategy of choice or necessity? [online]. Washington, D.C.: Center for Strategic and International Studies. Available from: http://csis.org/files/publication/140221_Bryden_ReinventionOfAlShabaab_Web.pdf. Bureau of Counterterrorism. (2015). Country Reports on Terrorism 2014 [online]. Washington, D.C.: U.S. Department of State. Available from: http://www.state.gov/documents/organization/239631.pdf. Dörrie, P. (2014). Al-Shabab: A close look at East Africa’s deadliest radicals. World Politics Review [online]. 18 August 2014. Available from: http://www.worldpoliticsreview.com/articles/14005/al-shabab-a-close-look-at-east-africas-deadliest-radicals. Felbab-Brown, V. (2015a). 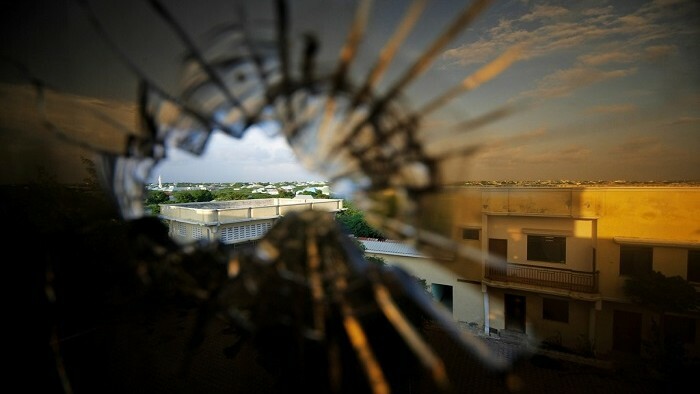 Counterterrorism and state-building in Somalia: Progress or more of the same? [online]. Author notes taken at presentation to the Brookings Institution, 21 May 2015. Washington, D.C. Available from: http://www.brookings.edu/events/2015/05/21-somalia. Felbab-Brown, V. (2015b). Saving Somalia (again): How reconstruction stalled—and what to do about it. Foreign Affairs [online]. 23 June 2015. Available from: https://www.foreignaffairs.com/articles/somalia/2015-06-23/saving-somalia-again. Gettleman, J. (2015). Shabab militants learning to kill on a shoestring. New York Times [online]. 6 April 2015. Available from: http://www.nytimes.com/2015/04/07/world/africa/setbacks-press-shabab-fighters-to-kill-inexpensively.html?_r=0. International Crisis Group. (2014). Somalia: Al-Shabaab—it will be a long war. Africa Briefing [online], 99. 26 June 2014. Available from: http://www.crisisgroup.org/~/media/Files/africa/horn-of-africa/somalia/b099-somalia-al-shabaab-it-will-be-a-long-war.pdf. Kay, N. (2015). Author notes taken at presentation to the Center for American Progress, 6 February 2015. Washington, D.C.
Keatinge, T. (2014). The role of finance in defeating Al-Shabaab [online]. London: Royal United Services Institute for Defence and Security Studies. Available from: https://www.rusi.org/downloads/assets/201412_WHR_2-14_Keatinge_Web.pdf. Maruf, H. (2015). Experts say al-Shabab-Islamic State linkup ‘unlikely.’ Voice of America [online]. 17 March 2015. Available from: http://www.voanews.com/content/experts-say-al-shabab-islamic-state-linkup-unlikely/2684247.html. Menkhaus, K. (2014). Al-Shabab’s capabilities post-Westgate. CTC Sentinel [online], 7(2), 4-9. Available from: https://www.ctc.usma.edu/v2/wp-content/uploads/2014/02/CTCSentinel-Vol7Iss2.pdf. Mesfin, B. (2014). What changes for al-Shabaab after the death of Godane? ISS Today [online]. 8 October 2014. Available from: http://www.issafrica.org/iss-today/what-changes-for-al-shabaab-after-the-death-of-godane. Mills, G., and Davis, D. (2015). Somalia: A case for (very) cautious optimism. Daily Maverick [online]. 27 January 2015. Available from: http://www.dailymaverick.co.za/article/2015-01-27-somalia-a-case-for-very-cautious-optimism/#.VZL4avlViko. Monitoring Group on Somalia and Eritrea. (2014). Report of the Monitoring Group on Somalia and Eritrea pursuant to Security Council resolution 2111 (2013) [online]. New York: UN Security Council. Available from: http://www.securitycouncilreport.org/atf/cf/%7B65BFCF9B-6D27-4E9C-8CD3-CF6E4FF96FF9%7D/S_2014_726.pdf. Williams, P. D. (2014). After Westgate: Opportunities and challenges in the war against Al Shabaab. International Affairs, 90(4), 907-923.